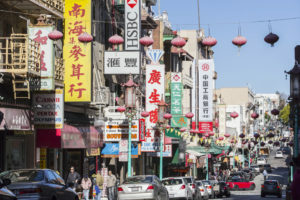 Centered at Grant Ave. and Stockton Street of San Francisco, Chinatown is the largest Chinese neighborhood outside of Asia, and also the oldest Chinatown in a North American city, in fact, Chinatown draws more tourists each year than the Golden Gate Bridge. With hospitals, parks and squares, a post office, and plenty of infrastructure, Chinatown plays host to a number of residents and visitors in this section of San Francisco. Mythical Maids is proud to provide our San Francisco house cleaning services to this historic part of the city, and to the residents of Chinatown. Many people opt to use professional house cleaning services in Chinatown to keep the home neat and tidy on a consistent schedule, while others opt to hire maids for special occasions to focus on other aspects of the party or event their hosting. No matter what your reason for a cleaning company, it’s important to ensure you hire the right company. Mythical Maids was founded right here in the San Francisco Bay Area, unlike some of the other chains, we’re proud to give back to the local community here in Chinatown. Superior customer service 7 days a week! Book your Chinatown house cleaning service today!